It looks like France has come up with a potential solution for the bird flu, but it would require killing off a whole lot of ducks and geese. The H5N8 bird flu virus has broken out in southwestern France, with at least 89 cases so far. Ducks stand in a livestock farm in Bars, southwestern France. Authorities in south-west France began a cull of hundreds of thousands of ducks January 5 as authorities scramble to contain an outbreak of a virulent strain of bird flu sweeping Europe. The farm birds in France's foie gras heartland are to be slaughtered to stem the spread of an outbreak of the highly pathogenic H5N8 virus. Livestock farmer Bernard Dupuy stands near his ducks in the family farm in Bars, southwestern France. 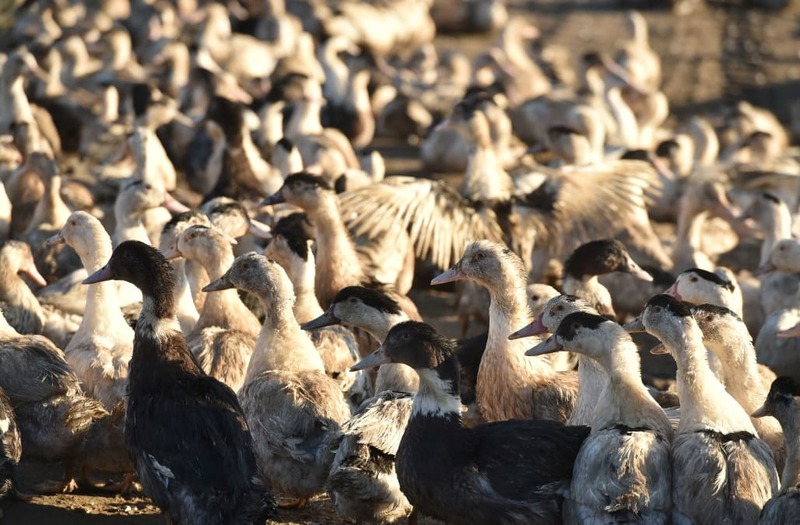 Authorities in south-west France began a cull of hundreds of thousands of ducks January 5 as authorities scramble to contain an outbreak of a virulent strain of bird flu sweeping Europe. The farm birds in France's foie gras heartland are to be slaughtered to stem the spread of an outbreak of the highly pathogenic H5N8 virus. Duck farmers drive birds out of an enclosure as they prepare to slaughter a portion of the farm's 32,000 ducks, in Belloc-Saint-Clamens, southwestern France, on January 6, 2017, during the first wave of a mass bird slaughter after the detection of bird flu. Authorities in southwest France began a cull of hundreds of thousands of ducks January 5 as the government scrambles to contain an outbreak of a virulent strain of bird flu sweeping Europe. The farm birds in France's foie gras heartland are to be slaughtered to stem the spread of an outbreak of the highly pathogenic H5N8 virus. Members of the protest group 'Canards en colere' demonstrate in front of the Auch prefecture on January 5, 2017, denouncing what they consider to be an inadequate bio-security required by the Direction generale de l'alimentation (DGAL) and approved by the Comite interprofessionnel des palmipedes a foie gras (CIFOG) and demanding imediate compensation for all the affected farmers as hundreds of thousands of ducks from open farming systems will be slaughtered in a bid contain a new outbreak of bird flu in France. An employee of duck farmer Sebastien Pujos drives a tractor with culled birds in Belloc-Saint-Clamens, southwestern France, on January 6, 2017, during the first wave of a mass bird slaughter after the detection of bird flu. Authorities in southwest France began a cull of hundreds of thousands of ducks January 5 as the government scrambles to contain an outbreak of a virulent strain of bird flu sweeping Europe. The farm birds in France's foie gras heartland are to be slaughtered to stem the spread of an outbreak of the highly pathogenic H5N8 virus. A picture taken on December 6, 2016 shows chickens at a henhouse near Loon-Plage. France raised its risk level for avian flu to 'high' after new cases of the 'highly pathogenic' H5N8 strain of the virus were detected. Employees of duck farmer Sebastien Pujos prepare to unload a truck with birds into an enclosure as they prepare to slaughter a portion of his 32,000 ducks, in Belloc-Saint-Clamens, southwestern France, on January 6, 2017, during the first wave of a mass bird slaughter after the detection of bird flu. Authorities in southwest France began a cull of hundreds of thousands of ducks January 5 as the government scrambles to contain an outbreak of a virulent strain of bird flu sweeping Europe. The farm birds in France's foie gras heartland are to be slaughtered to stem the spread of an outbreak of the highly pathogenic H5N8 virus. The government has responded by culling any free-range ducks and geese in the area to prevent the spread of the disease, with 800,000 birds estimated to be killed in the next week. H5N8 virus is highly contagious and deadly, but has never been found in humans.